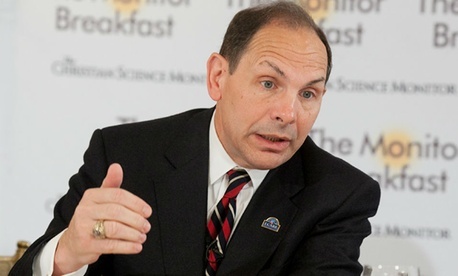 VA Secretary Bob McDonald on Thursday defended his commitment to holding employees accountable and firing them when necessary and according to the law. Responding to criticism that the department has been too slow to sack top leaders involved in falsifying patient care documents and other controversies, McDonald said the VA is “moving as aggressively and as expeditiously as possible” and that there are more than 2,000 employees who currently face disciplinary action, including possible termination. That number includes the 40 or so cases of senior executives under investigation for wrongdoing. The VA has recommended firing some top leaders, but it’s not clear how many have actually been terminated since the scandal over patient wait times and scheduling delays came to light and caught the attention of Congress and the Obama administration this past spring. The department in fiscal 2013 fired 2,247 employees for disciplinary or performance reasons, more than any other Cabinet-level agency, according to data from the Office of Personnel Management. That amounted to about 0.7 percent of its workforce. Two members of the Senior Executive Service were fired in fiscal 2013; the SES represents less than 1 percent of the VA’s total workforce. The 2014 Veterans Access, Choice and Accountability Act allows the department to fire and demote Senior Executive Service employees immediately, with paychecks getting cut off the day of the termination. The affected executive would then have seven days to issue an appeal to the Merit Systems Protection Board, which in turn would have 21 days for an expedited adjudication. MSPB’s ruling would be final. But McDonald reiterated that the new law doesn’t allow VA to fire senior leaders without cause or due process, and really only shortens the time that a senior executive proposed for removal by VA has to appeal the department’s decision. “The law didn’t grant any kind of new power that would suddenly give me the ability to walk into a room and simply fire people,” said the Army veteran and former head of Proctor and Gamble. “I wouldn’t do that anyway. Our Constitution provides for due process.” McDonald also cited the need for the Justice Department’s ongoing criminal investigations of some employees to be completed before the department can proceed with disciplinary action, including firing. The typically genial VA secretary, who insists that everyone call him “Bob,” became prickly after one reporter at Thursday’s breakfast questioned whether the department really had to wait for Justice to weigh in before it could fire people. A Nov. 5 report in Stars and Stripes quoted a Nov. 3 email from Justice to the House Veterans’ Affairs Committee that said the department “takes no position concerning whether the employment matters…should proceed or be stayed,” while criminal probes are ongoing. “Perhaps your law degree is more credible than others, but I would encourage you to talk to someone who is an expert in constitutional law and federal law, and just check your sources,” McDonald told the reporter. McDonald, who has only been in the job a few months, cited the department’s ongoing progress to reinvent itself to better serve the country’s vets. He said the department so far has reduced the national new patient primary care wait time by 18 percent, managed to roll out the first phase of a program allowing some vets temporary access to private health care rather than waiting for a VA appointment or traveling more than 40 miles to a VA facility, and scheduled more than 1.2 million more appointments in the last four months than in the same period in 2013. McDonald has traveled the country extensively since he took over at VA this summer, visiting 41 facilities in 21 cities and making 11 recruiting visits to medical schools. The VA announced this week that it has created “a new award program” to highlight employees who embody the department’s new credo – ICARE (Integrity, Commitment, Advocacy, Respect and Excellence). The VA will begin accepting nominations for that program in January.